A ‘Round Table Dialogues’ for peace in South Sudan and the Democratic Republic of the Congo is due to take place in Rome. 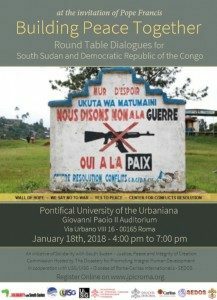 The forum, which is arranged by Solidarity with South Sudan and the Justice and Peace Commission Secretariat (JPIC), will be held at Pontifical University of the Urbaniana on 18th January 2018 at 4.00 pm. The ongoing violence in South Sudan and the Democratic Republic of Congo has caused Pope Francis to lead a prayer for peace in both countries on 23rd November 2017 in Rome, at St. Peter’s Basilica. This time an invitation has been extended to men and women religious, and all those concerned with both countries, to participate in round table dialogues. The dialogues aim to promote actions of solidarity by “Building Peace Together”. Solidarity with South Sudan, one of the organisers, informs that “participants will experience a sensitive and faith-filled panel discussion around the importance of being committed to personal peace, attentively living in peace and consciously maintaining peace”. Three panellists, who are highly experienced on the two countries, have been invited to “discuss the root causes of these tragically conflict areas and help participants to explore concrete ways to accompany the analysis with meaningful action together”, adds Solidarity with South Sudan. ‘Round Table Dialogues’ for peace in South Sudan and the Democratic Republic of the Congo is an initiative of Solidarity with South Sudan and the Justice & Peace and Integrity of Creation Commission (JPIC). The event is hosted by The Dicastery for Promoting Integral Human Development in collaboration with various groups and universities. Principal, Solidarity Teacher Training College, engaged in South Sudan Project for 10 years.